Violent crime at sea — including murder — often goes unreported, and therefore uninvestigated and unprosecuted. Up to 70 percent of violent crime in the Gulf of Guinea, for instance, goes unreported, according to the International Maritime Bureau. International treaties can and do establish clear lines of responsibility for investigating and taking action against violence. Piracy may have played second fiddle to maritime terrorist attacks and threats in recent weeks, but there is a worrying rise in attacks off SE Asia, concerns that the tinder of piracy may reignite in Somalia, and the fear that reports are being suppressed in West Africa. 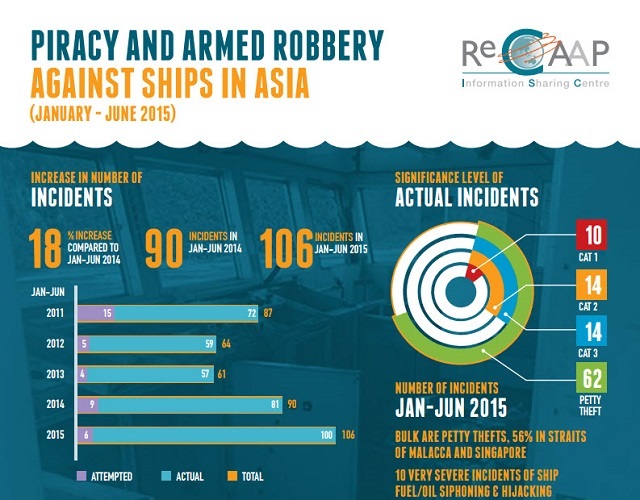 ReCAAP Information Sharing Centre (ReCAAP ISC) recorded 106 piracy incidents in Southeast Asia in the first half of 2015 (1H15), an increase of 18% year on year. Out of the 106 incidents, six cases were classified as attempted incidents, while the remaining 100 cases were actual incidents. The bulk in this period was petty thefts, although there were 10 severe, or Category 1 incidents, involving fuel/oil siphoning and hijacking.